The Taco Brothers take taco eating and taco making very seriously, so serious in fact they decided to develop an exciting Mexican themed 5 reels to get the meaty juices flowing and earn themselves some wealth for their taco empire. 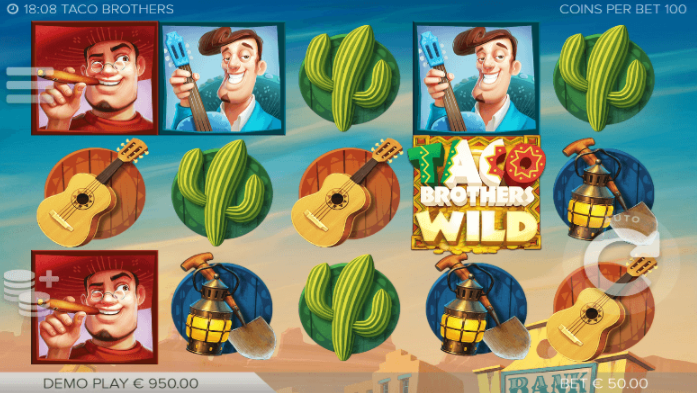 Spin the reel on this spicy UK slots online game and tuck into some wacko taco fun through this cactus infested adventure, sporting a classic Mexican theme with tequila symbols and many more. 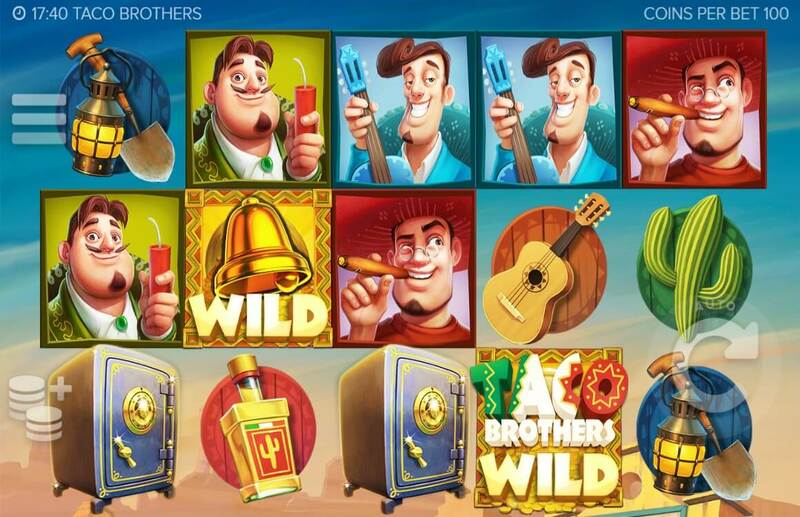 So amigos, come on and earn yourself some huge multiplier bonuses and loyal taco companions for life. As the first Swedish game studio with a focus on slot games for the mobile platform, ELK (founded in 2012) aims to build the most entertaining games within the industry. This developer ensures that all of their games match their three specific criteria within their discipline. With a focus on Art, Technology, and Math, ELK intends to deliver efficient, beautiful games that have a solid grounding, to provide fair and exciting experiences. Based in Stockholm, ELK loves bringing their characters to life with elegant animations and engaging art styles. Taco Brothers are the story of a group of three brothers, on a journey to stop the evil captain Diaz, who is depriving the people of the town of the tacos they eat. With a friendly, likeable theme, this online slot game truly captures the player’s attention, holding them while they enjoy their tequila in the calm desert atmosphere. The animations for all aspects of the game are fluid and engaging, with each symbol being clearly represented on the board – cacti, guitars, and lanterns perfectly represent the atmosphere. Coupled with the fact that the music is soothing and simple, it’s difficult to put this game down. This online slot game has a 4 x 5 board, with a whopping two hundred and forty-three pay lines. With the three brothers – Pepe, Pico and Paso – getting you a number of handsome rewards, this game has the potential to provide the player with some great bonuses! Take, for example, the Wild Escape Bonus. This is triggered by 3 Safe Symbols, and you may also get another chance to spin these in. Once triggered, Free Spins will be awarded and all wins will be multiplied by the Exploding Safe Multiplier; given thanks to Pico's skill with the Dynamite. 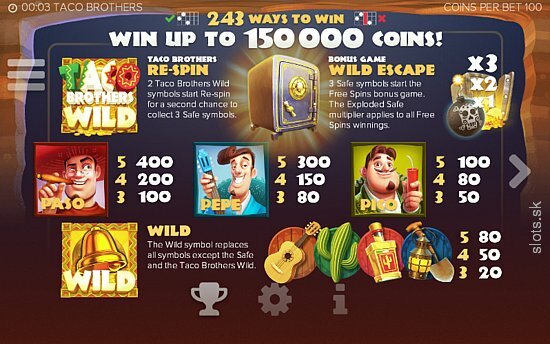 During the Free Spins, Running Wilds will also be in play, and the Taco Brothers will be trying to escape across the reels 1 reel at a time. This free spins will continue until all brothers have escaped. However, the appearance of Captain Diaz means that 1 brother will be imprisoned and, if he imprisons all 3 brothers before they escape from the town, the bonus will end. However, there is also a guardian angel in the form of a senorita who can turn up; releasing one of the brothers to help the bonus keep going. One of the most interesting things about ELK’s Taco Brothers is that of the ‘Betting strategy’ – allowing you to choose how, and when, your bet changes. This automatically changes depending on the rules you have given it. Take, for example, the ‘leveller’ strategy. For every fifth consecutive round you lose, it ups the betting level by two (which is, again, completely customisable). When you win, this bet level change is reset – ultimately meaning that you have the potential to win on your larger bets. With one of the more visually pleasing online slot games that feature on Wizard Slots, Taco Brothers present an amusingly stereotypical look at a Mexican town – with bank robberies, taco thieves, and tequila by the gallon. This delightful art style and betting strategy system make this one of the more enjoyable online slot games. I wholeheartedly recommend it! If you enjoyed Taco Brothers online slots game then you might also like Alice in Wonderslots slots game or to discover more easy slot games Click here.